A bounty of dining choice from flexible á la carte to an elegant tasting menu. The best of what’s available from our butcher shop and our California farmers. 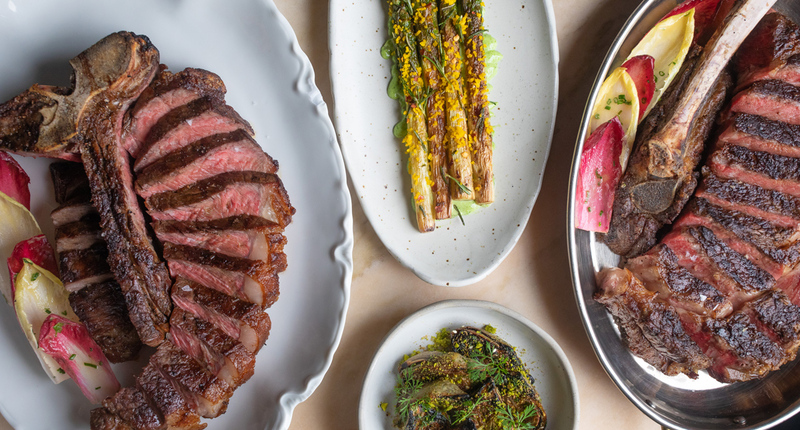 Dinner at Gwen is more than a dining experience — it’s a visceral one, as you’re surrounded by glass-enclosed dry-age rooms, curing charcuterie, and at center stage - a fire pit smoking, searing and roasting. 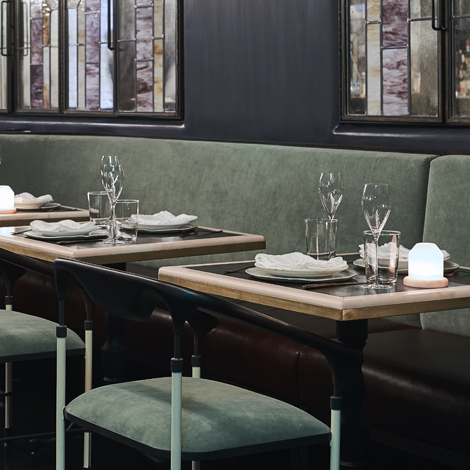 The visuals at Gwen subtly call to mind our primitive past and are meant to offer a glimpse into the meal that’s about to unfold and how it came to be. A flexible choice from our á la carte menu which also includes our butchers list of the best steaks on the planet. Our seasonal sides are often inspired from our neighbors at the Hollywood Farmers Market, just steps away. Designed by HOME STUDIOS in Greenpoint, Brooklyn, Gwen’s design pays homage to the building’s historic past. Walking through the butcher shop into the dining room, your attention is immediately drawn to the fire roaring from the asador, where your dinner for that evening is roasting. Rich leather banquettes, dramatic lighting and touches of copper and pink marble create and elegant yet inviting environment. Our Wine Room and private dining area offer a quiet and secluded place to enjoy your experience at Gwen. 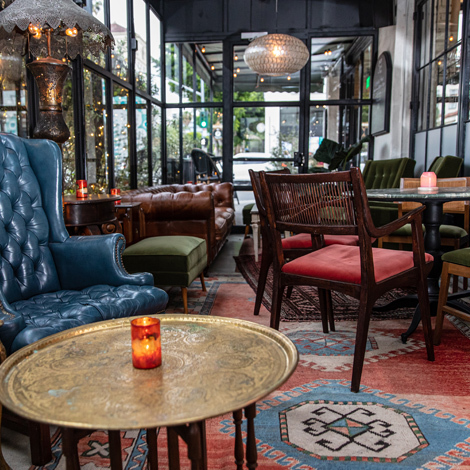 Set on the mezzanine level of the restaurant with 30 seats surrounded by Gwen’s wine collection hidden behind the custom-made art deco glass cabinets, the Wine Room affords a tranquil spot for dinner or a great venue for your next event. Gwen’s wine list will feature selections from around the globe. Local wines from the Central Coast are offered alongside wines hailing from farther regions. Because they pair perfectly with charcuterie, rosés and skin-fermented white wines often known as “orange” wines will play a prominent role on the list year-round.